Since 1991, TurboChef Technologies has pioneered the world of rapid cooking. TurboChef has redefined cooking efficiency through their design of rapid-cook ovens that are versatile, user-friendly, and save energy. TurboChef ovens cook faster and produce consistent results without compromising quality. Rapid Cook: rapid cook ovens utilize top and/or bottom air impingement assisted by precise bursts of microwave to decrease cook times by more than 80% without compromising quality. Conveyors: TurboChef’s unprecedented High-h air impingement and available catalyst technology heats food faster than any other conveyor on the market. 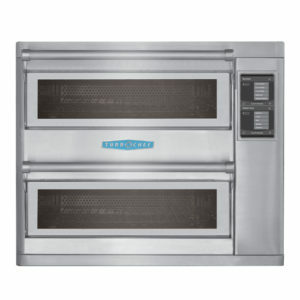 The Double Batch oven has two independent cavities that circulate impinged air at speeds of up to 50 mph. This created high heat transfer rates and significantly reduces cook time. Each cavity of the double batch utilizes variable speed blowers, oscillating racks, and catalytic converter, which results in minimal energy input, high food quality, and UL certified ventless operation.